For a while now I’ve been mulling over the idea of shrimp and pasta in a tomato-based sauce. Last weekend, when we ran out of fresh protein in the fridge, I decided to thaw some shrimp and give it a go, and I was really pleased with the result, which was very flavorful. I started my meal based on this recipe from Stephencooks, and went from there, using what I had on hand. We thought this was fantastic. The sauce was so flavorful that it could easily be done without the shrimp if desired. Toss shrimp with garlic and oil. Allow to marinate while working on the sauce. Melt better in a large skillet, and add minced bacon and shallot. (I used end bacon that was very hammy, with only a little fat.) Cook until browned and caramelized; meanwhile, stir tomato paste into wine. Deglaze pan with tomatoey wine and allow to reduce by half; add cream, tomatoes and paprika, and taste; if acidic, add sugar, and season to taste. Allow to simmer until slightly thickened, reduce heat to low, then put on the gemelli to cook in a large pot of water. When the pasta is nearly ready, heat a small skillet or grill pan and cook the shrimp until pink and nearly done (about 60 seconds on one side, 30 on the other). 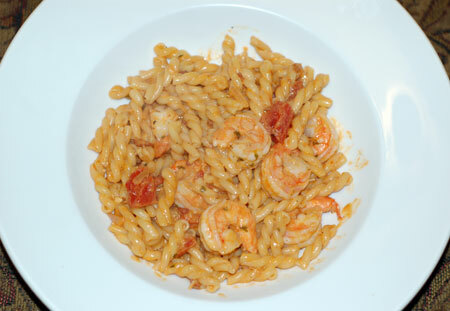 Stir the shrimp into the sauce, drain the finished gemelli, and toss it in with the sauce and shrimp. Continue cooking for about a minute to meld the sauce with the pasta, taste and adjust seasoning, and serve. Update 7/31/07: I made this dish again tonight, after receiving requests for it less than a week after I first tried it out. This time I used some uncured bacon from LifeSource, and it was just as tasty as we remembered it. I think it would work nicely with bits of chicken instead of shrimp too, or even some mild sausage. This sounds fantastic. I am a huge shrimp lover, so this will be perfect for me! Thanks, Deborah! If you do try the recipe, be sure to let me know how it comes out!